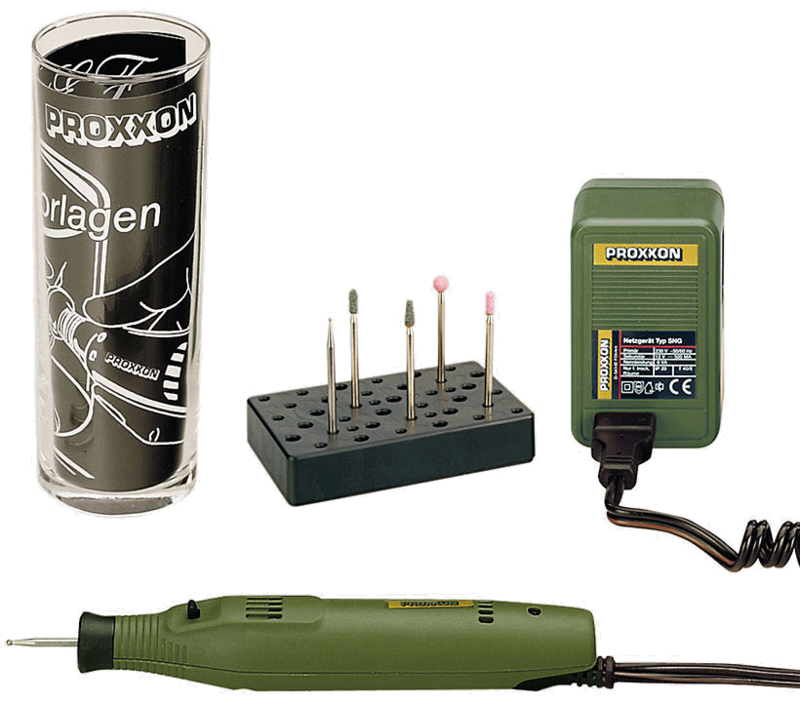 The ideal starter set for all engraving applications. A neat storage solution! Each part finds its place in a practical and sturdy plastic case. With engraver GG 12, trial glass, patterns and all necessary bits to start right away. The engraver GG 12 spins at 20,000 rpm, yet weighs only 4 ounces! It allows for easy control and thus very safe operation featuring a touch sensitive switch for easy use and a simple push in/pull out shaft holder for easy accessory changeover (shaft capacity Ø 3/32" (2.35mm) only). 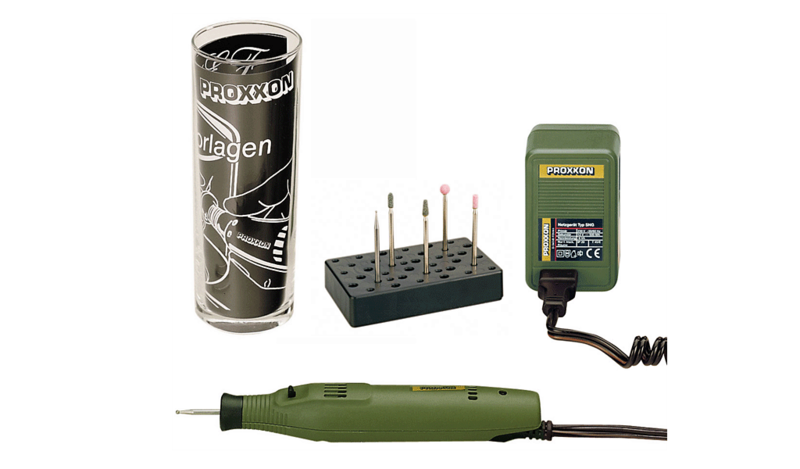 The set includes: Engraver GG 12, AC adapter (12 - 18V, 0.5A) trial glass and four bits: two spherical head diamond grinding bits Ø 1/32" (1,0mm) and Ø 5/64" (1,8mm) for engraving and line work, two silicon carbide grinding bits (conical and bullet shape) for shading and frosting, one corundum grinding bit in ball and cylinder shape for grinding and engraving (all shanks 3/32" (2.35mm)) as well as a bit holder usable for holding MICROMOT rotating bits. The bits are also optimal for working on metal, stone, shell and other hard materials. Includes 1 diamond bit with spherical head size 5/64" (1.8mm). For operation a mains adapter is required. We recommend PROXXON MICROMOT power supplies NG 2/S and NG 5/E or other power supply units with a minimum capacity of 0.5A.